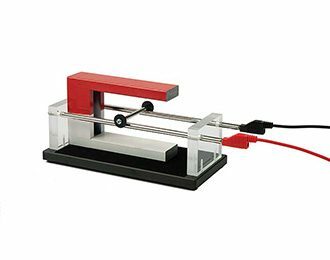 The Laplace Force Demo with Magnet demonstrates the forces on a current-carrying wire in a magnetic field. When the conducting rod is placed on the rails and a current (maximum 10 A) runs through the rails, the rod will be affected by a force, making it roll perpendicular to the magnetic field along the rails. The apparatus consists of a pair of rails with 4 mm diameter terminals. The conductor consists of a bar with plastic discs that is placed across the rails. The included AlNiCo Horseshoe Magnet (SF-7225) is used as a magnet.